A few years back I had visited a young man in the hospital who had been diagnosed with terminal brain cancer. It was one of the most challenging moments for me as a pastor, but that was nothing compared to what that young man and his family experienced. The young man shared his story with me and how although his diagnosis caught him by surprise there were signs. For quite some time his body had been giving him signals that something was not right. For a couple of years, he had been having headaches, fatigue, problems sleeping, and nausea. He constantly dismissed the signs as just the stresses of life (job, family, money, etc.) and refused to get help or see a doctor until the final signal that sent him to the hospital. One day while at work he experienced a seizure and then later a CT scan at the hospital revealed his worst fear. After the revelation, he fought cancer for nearly 2 years but was ultimately unsuccessful. He said that his biggest regret was not getting help sooner when his body was warning him something might be wrong. Why do we often refuse to get help when something is wrong? Maybe it is because we refuse to be needy. But then why do we consider being needy to be such a bad thing? Being needy is not a bad thing! Being needy is just admitting to that fact that we may not be able to do everything on our own. The truth is that we can not live a life of absolute independence. God created us knowing that we needed each other. In Genesis 2, we read a narrative of how God created us and at the moment of our creation recognized our need for each other by saying, “It is not good for the man to be alone. I will make a helper suitable for him.” Often we hear that story as suggesting our need for romantic relationships, but we were created needing each other for far more than companionship. The Apostle Paul in 1 Corinthians 12, reminds us that we are all one body made up of many parts and not one part is more important or can live apart from any other. We need each other. The body of Christ, the church, is where we come together and our ultimate needs are met. 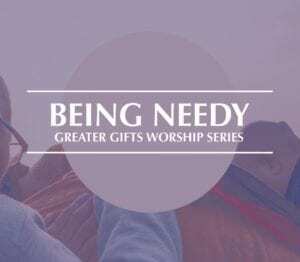 This Sunday, January 27th, join us for Sunday School at 9:30 AM and Worship at 10:30 AM as we continue this discussion on “Being Needy” and how the Body of Christ comes together to satisfy those needs.